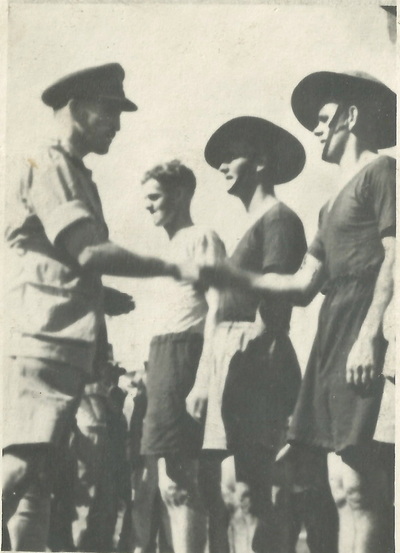 Syd Campbell, Saugor Camp 1942. In late October 2014 I was fortunate to receive a cluster of family contacts concerning men who had taken part on Operation Longcloth by serving in one of the 142 Commando Platoons. 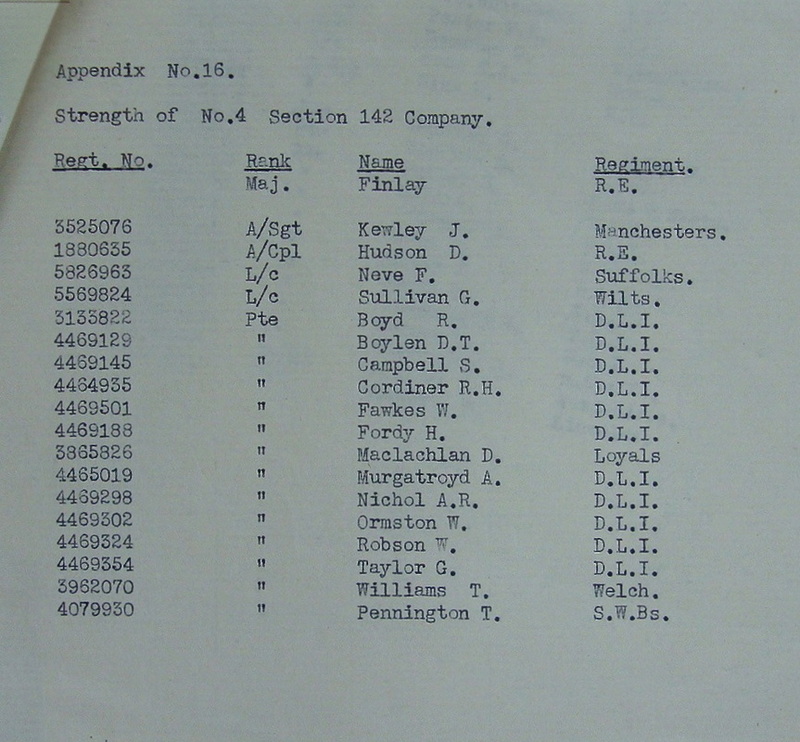 One such contact was Syd Campbell, the son of Pte. 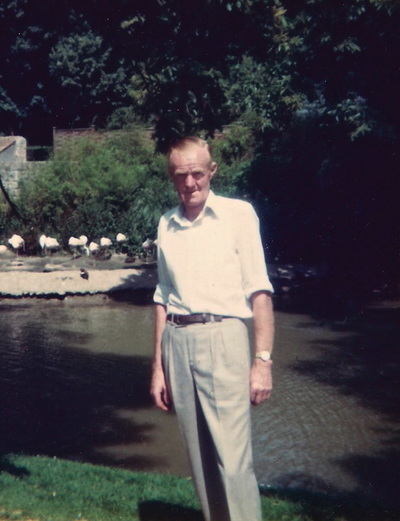 Syd Campbell, formerly of the Durham Light Infantry and a member of Chindit Column 4 in 1943. Syd (Junior) told me that his father was a bricklayer by trade and had been kept back from enlisting into the Armed Forces earlier in the war due to his 'reserved occupation' status as part of the building trade. Syd Campbell and his long time school friend Pte. Ren Nichol were both from North Shields in Northumberland and were finally called-up in the middle years of the war and joined the Durham Light Infantry for their initial Army training. Two more of their work pals also joined the DLI at that time; William 'Ginger' Ormston from Wallsend and William 'Robbo' Robson from Ferry Hill in County Durham. All these men found infantry training rather taxing and it wasn't long before they took their opportunity for more adventure by volunteering for overseas service in Special Forces. All four men can be seen in the photograph at the top of this page. From left to right we have; Bill Ormston, Ren Nichol, 'Robbo' Robson and Syd Campbell. Syd (Junior) also told me that his father was a top marksman with the Lee Enfield Rifle and represented the 13th Battalion of the King's Regiment in many competitions in India. The family still posses the trophy that Syd won whilst with the 13th King's which describes him as 'Champion Shot'. They also have Syd's old Army Bible which confirms his placement in the 142 Commando Group. The family very kindly sent me several photographs of Syd Campbell and his comrades from 142 Commando. I have to say that these are probably the best set of images I have seen in regard to the Chindits in training at the Saugor Camp. I have used some of these photographs here as part of this story, but have also placed several in the Gallery-ID-Parade pages of this website. Please follow the link below and scroll down to the relevant images. Seen below are some of the images in relation to the story of Pte. Syd Campbell, please click on any image to bring it forward on the page. 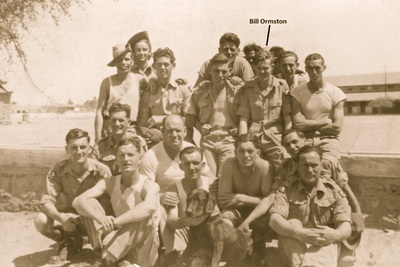 As already mentioned in this account, Syd Campbell and his three friends were all placed in to the Commando Platoon of Column 4. 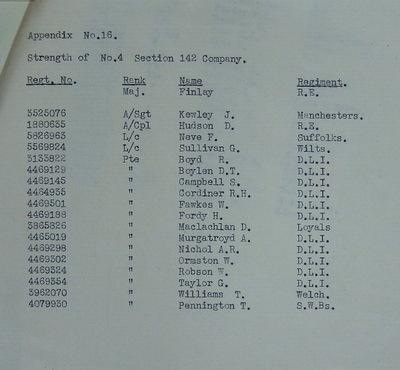 There were in fact eleven men from the Durham Light Infantry in this unit as can be seen from the personnel listing pictured above. There were at least 40 other men from the DLI that served in one Chindit unit or another in 1942-43, many of these served in the Commando Platoons from across the Brigade. Column 4 was primarily a Gurkha unit and formed part of Northern Group in 1943, it was commanded in the first instance by Major Philip Conron. 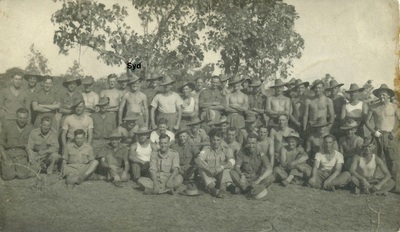 The column was the first unit from Northern Group to be attacked by the Japanese and generally had a difficult time inside Burma. 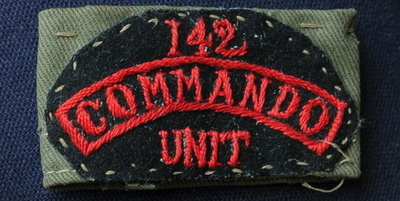 Syd Campbell's Commando Platoon would have been the only unit from Column 4 made up entirely of British Army personnel, the rest of the column would have comprised of Indian and Gurkha troops. Early on during the operation Wingate lost confidence in Major Conron and replaced him with his own Brigade-Major, George Bromhead, formerly of the Royal Berkshire Regiment and a relative of Major Gonville Bromhead VC of Rorke's Drift fame. 4 Column was the first of the seven to break up and return to India. It had been led from the start by Major Conron of 3/2nd Gurkhas and had reached the Brigade rendezvous at Tonmakeng on 24 February. Thereafter it was tasked to protect a Brigade supply dropping and then to reconnoitre and improve Castens Trail, the secret track of the Zibyu Taungdan Escarpment. It was hard work clearing the route, but necessary to avoid the Japanese. As the columns descended they saw a deep valley, in reality the head-waters of two: the Chaunggyi or Great Stream, which went northward for a few miles before turning abruptly to the west to break through the Zibyu Taungdan in a deep gorge; and the Mu Valley proper. Conron was never able to tell his side of the story. After Wingate later ordered the dispersal of the columns he was last seen near the Shweli River in command of a group from Brigade Headquarters. According to an eyewitness account he was drowned through the treachery of Burmese boatmen while attempting to cross that river. 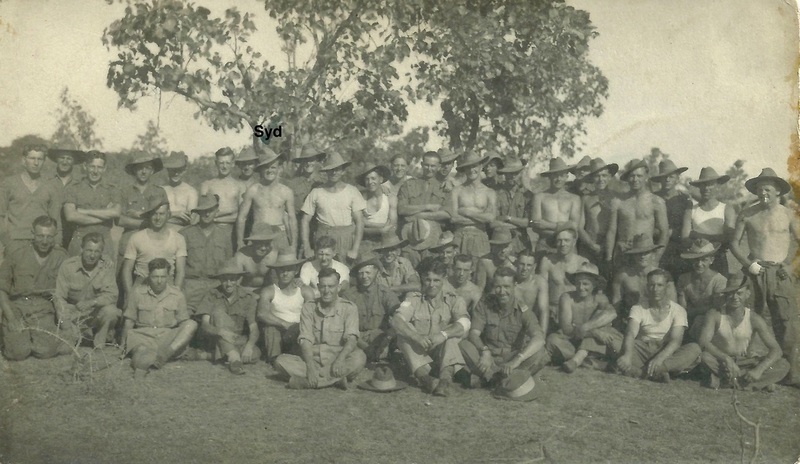 On 2nd March, the day after Bromhead took over command, the Burma Rifles reconnaissance detachment bumped a group of Japanese soldiers near Pinbon and one man was lost. A fighting patrol out searching for the missing man encountered another Japanese patrol and shot dead an NCO. In the meantime Wingate had decided to shift his attack on the railway from the Indaw area to the Wuntho-Bonchaung area, thirty-five miles further south. He instructed 4 Column to rejoin the main group without delay. During the morning of 4th March, while the column was marching south-east along the base of the mountains, all hell broke loose. The column was in the usual single-file 'snake' formation and strung out over 1,000 yards when the undergrowth came alive with enemy small arms fire. Half of the formation had already crossed a small stream, when a shower of enemy mortar bombs began to fall on the ford, preventing the rest from crossing. The column had walked into a trap. While a rearguard platoon held the enemy at the stream, Lieutenants Stuart-Jones and Green and Subedar Tikajit Pun led 135 men and thirty mules away to the north. The remainder of the column that had already crossed the stream dispersed in small groups and headed for the pre-arranged rendezvous twenty miles to the south. 'We met a Jap patrol and although we beat them off our only radio got a bullet. Since the Japs used soft-nosed bullets it was the end of that radio. The column was split by the encounter, but all reached the rendezvous that evening and we sat down to consider our situation. No communications, little food and no way of getting more except courtesy of the locals, and the British Officers of the Gurkha column reported very poor morale. What to do? 'We could not influence the war, so I decided to turn back. At this point our luck changed a bit. A villager told me that at the top of a steep hill behind the village there started a forest boundary trail, going, roughly, the right way. The hill was certainly steep, but the Gurkhas with their kukris cut steps for the mules and we all reached the top. And there was a well marked trail and I could recognise the forest blazes. We managed to buy enough rice and had an uneventful march back to the Chindwin. I mapped the route and by coincidence a battalion of my regiment (Royal Berkshires) used most of it later when Burma was invaded. On the way back my main worry was that we might be mistaken for the enemy by our own forces. Fortunately we spotted a British patrol east of the Chindwin before they saw us and made contact. We crossed the river where a battalion of a State Force held the front. Jaipuris I think. Memorable because the Commanding Officer said, "I expect you could do with a bath", and his men dug a hole, lined it with ground sheets and filled it with hot water. The best bath I can remember. I had written a series of non-committal "air grams" before we went into Burma and left them back at air base to be posted weekly. Thus it was that my mother got a brief letter saying that all was quite routine, at the same time as she opened her morning paper to see my ugly mug spread across the front page. 'I went back to Imphal and set up shop at the Army HQ. My tummy rebelled in a big way at the rich food and I realised that when the Brigade got back some hospital checks would be necessary. As for Lieutenant Stuart-Jones, his troubles were only just beginning. On the evening of the ambush he led his men north in an effort to contact the other columns. After two days he handed over command to Captain Finlay of the commando detachment and went ahead with eight others. Six days later, out of food and near collapse, they made contact with 8 Column. In the meantime Captain Finlay and his party had turned back for India, menaced by starvation. 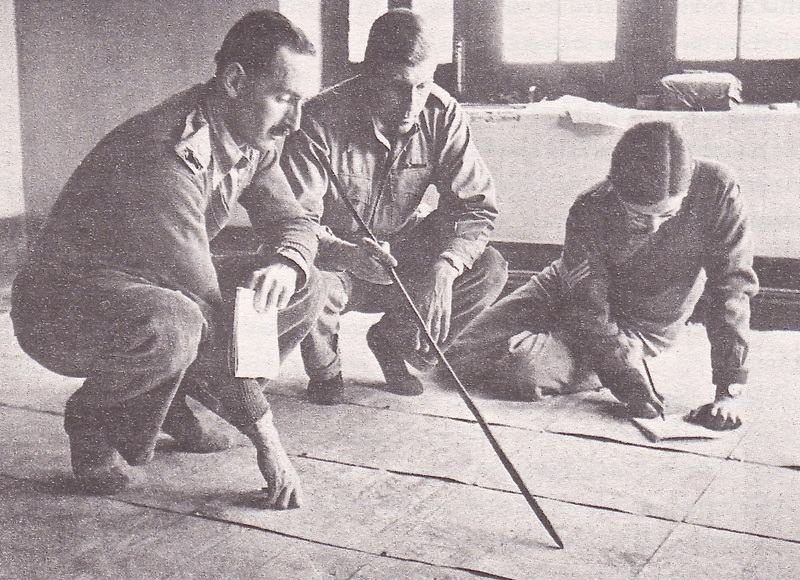 Weeks later, Stuart-Jones and his four faithful Gurkha Riflemen reached safety in Fort Hertz, a British outpost on the border with China. Seen below is a map of the area around Pinbon where the Japanese ambushed Column 4 in early March 1943. Also shown is a rare photograph of Brigade-Major, George Bromhead, seen discussing pre-operational plans with Brigadier Orde Wingate in January 1943. Please click on each image to bring them forward on the page. So, it would seem that after the ambush at Pinbon, Syd Campbell and the Column 4 Commandos were still moving east with Lieutenant Stuart-Jones's group. 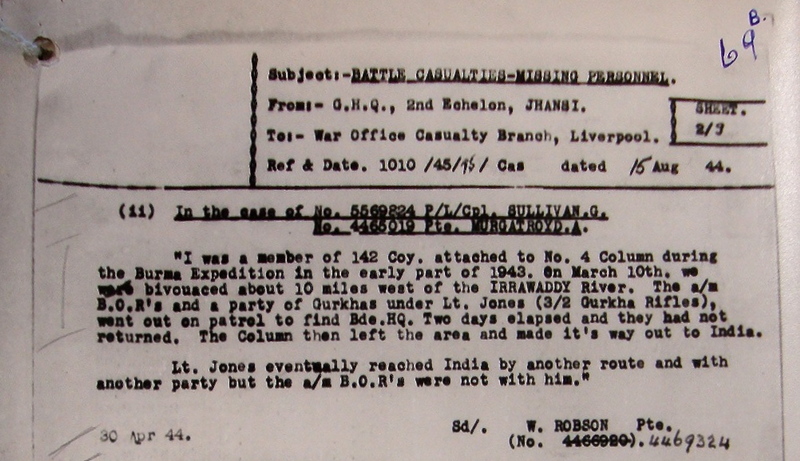 Later on, Stuart-Jones took a small party of men and attempted to make contact with the main Brigade, he did eventually stumble across Column 8 and remained with this unit until full dispersal was called in late March 1943. 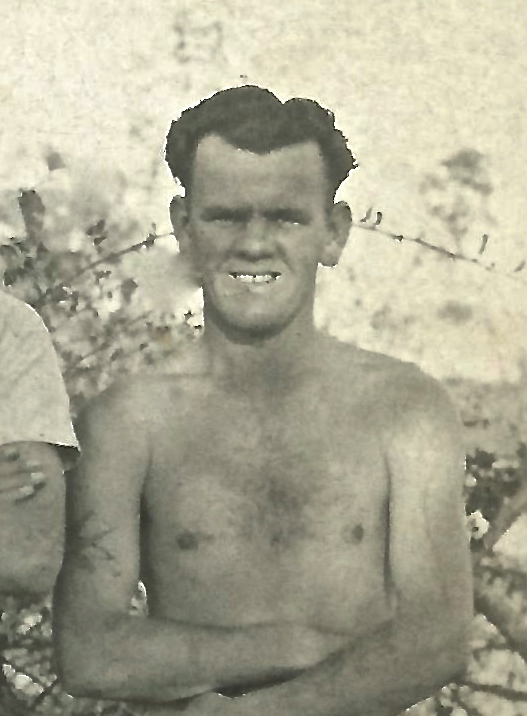 The two men mentioned in the witness statement given by Pte. 'Robbo' Robson (seen earlier in this story), Alec Murgatroyd and Lance Corporal George Sullivan were both with Lieut. Stuart-Jones. 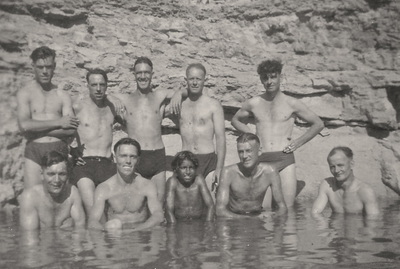 The 142 Commandos under the leadership of Captain Finlay, formerly of the Royal Engineers, managed to find their way back to India, but it had been a close run thing for the men, who by this time were both famished and exhausted from their ordeals. 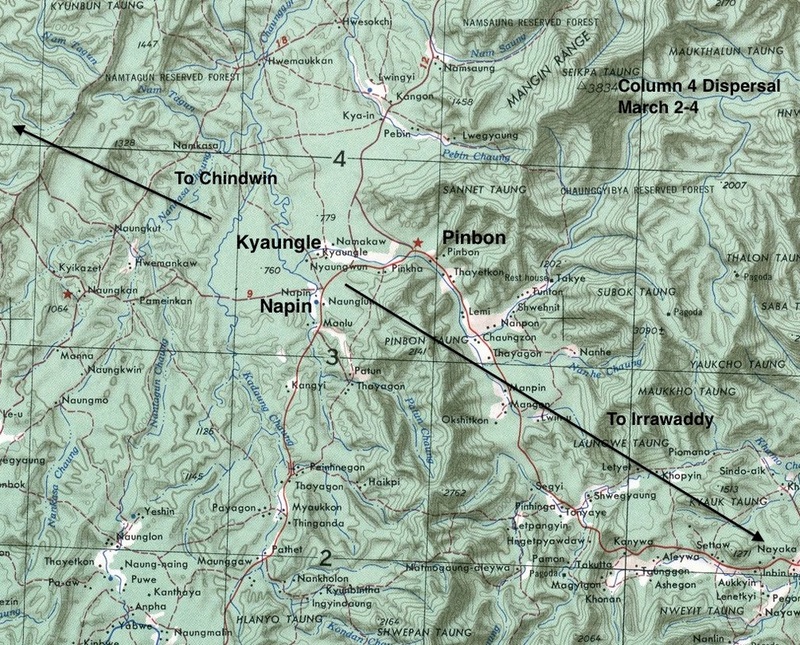 On the 2nd and 3rd March, No.4 Column carried out various reconnaissances in the Pinbon area occasionally colliding with the enemy and collecting one Japanese body. I had ordered the Column Commander (Bromhead) to pass Pinbon eastwards not later than the 4th if he could, as I still intended to move on to Indaw. Hearing nothing from No.5 Column about the "Happy Valley" route and learning from No.3 that the Kaignmakan route was clear, I decided to use the latter. This directed my main force on Wuntho and not Indaw. I therefore informed No.4 Column that the plan was changed, and since his wireless set was working badly, ordered him to join me before I proceeded. He started out to do this on the 4th, and early in the morning encountered an enemy force of unknown strength, in the neighbourhood of Nyaungwuw. There followed what can only be described as a disgraceful exhibition of panic by the Gurkha Rifles; both the Burma Rifles and the British troops remaining firm and endeavouring to obey their Commander and restore order. 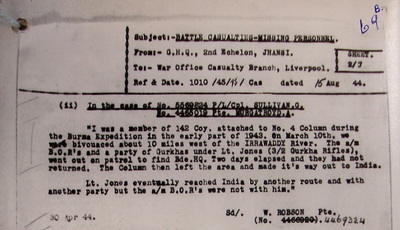 The brilliant history of the Gurkha Rifles in war, and indeed the splendid performances of No.3 Column in those Operations, makes it all the more necessary to tell the truth about what occurred on 4th March, but this is not the place for a post mortem. It is sufficient to say that after repeated attempts to rally the Column and counter attack, the Column Commander did ultimately collect the greater part of his force at his Operational Rendezvous. Here I must point out that without the use of a Rendezvous to be used on Dispersal, this Column would have broken up and few indeed would have returned. In the panic, the cipher had been lost, and it was quite impossible for me to send a R.V. in the clear although a cryptic message was sent from which it was hoped the general line of my advance could be deduced. This message did not reach the Column Commander. The latter, who was now without supplies or means of obtaining them, had lost much indispensable equipment, and was separated from the Brigade Group by strong enemy forces, rightly decided to march back to the Chindwin. I have no adverse comment to pass on his conduct which showed judgment and courage throughout. The faults of No.4 Column were those of others. After reaching the safety of Allied held lines, the men from 142 Commnado were taken back to the hospital at Imphal and received excellent medical care from the nursing staff under the brilliant leadership of Matron Agnes McGeary. Syd and his pals would have enjoyed several weeks of rest and recuperation in the hill stations of Assam, before re-joining the 13th King's at their new home, the Napier Barracks in Karachi. After the war Syd Campbell returned home to North Shields and resumed his employment as a bricklayer, he continued to work alongside his best pal, Ren Nichol until his (Syd's) unexpected death in 1969 aged just 48. I am the daughter of Bill Ormston, who was one of the bricklayers of Column 4 referred to by Syd Campbell. I have found your website of great interest and have some additional photographs of the Chindits which are not shown on the site and which may be of interest to you. If you can provide me with your contact details I will forward on the relevant photos, which you might wish to add to the various galleries. 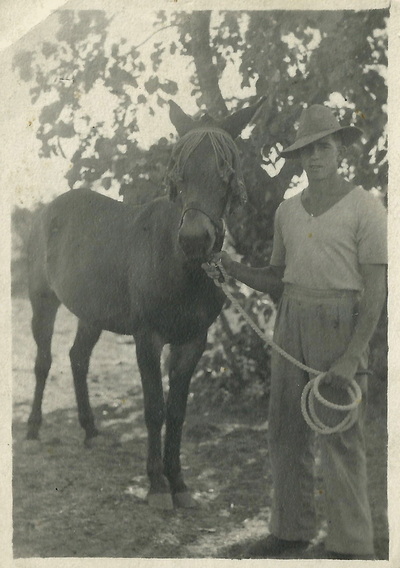 Unfortunately, I don't know a great deal about my Dad's time in the Army as he would never speak about it, other than to tell us how he survived in the jungle eating insects and anything else they could find when their rations ran out. He never mentioned the fact that he was a Commando in Burma. He must, however, have been impressed with his time in India as he did say he would like to take the family back there if he could ever afford it, but sadly this never happened. He was born in North Shields in 1920 and attended the Jubilee School. He then became a bricklayer working alongside his friends Syd Campbell, Ren Nichol and Robbo Robson. He enlisted into the Army in 1941 and his regiments included the Durham Light Infantry from late 1941 until July 1942, followed by a short period with the Yorks and Lancs, before joining the King's Regiment on the 30th September 1942. He remained with the King's until his demob in April 1946. 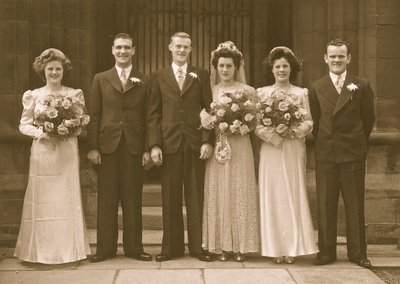 ​Not long after leaving the Army, he got married and moved to Wallsend with his wife, Audrey. He lived there all his life and continued on as a bricklayer throughout the whole of his working life. He was due to retire in November 1985, but sadly died in June of that year, leaving behind Mam, myself and my brother Norman. Please do use any of the photographs for your website, they are mostly of Dad and his Chindit pals enjoying a swim, presumably in India. There is also a certificate confirming his participation on the 1st Wingate Expedition in 1943 in Burma. I would be very interested in any new information you might possess about his time with the Chindits. I have also sent you a photograph of my Mam and Dad's wedding day in September 1946, which shows both Ren Nichol and Syd Campbell (senior). The final photo shows Dad on holiday in Jersey, this was taken in 1980 when he was 60 years old. The new photographs and information in regards to Pte. 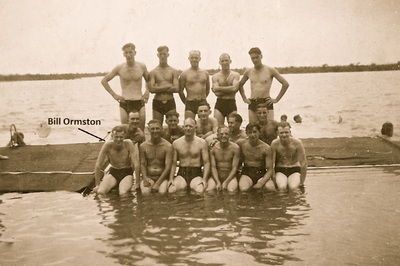 Ormston were of course of great interest to me, especially the details of his regimental postings during WW2. I have always struggled to find an arrival date at the Chindit training camp for the draft of men that came originally from the Durham Light Infantry. 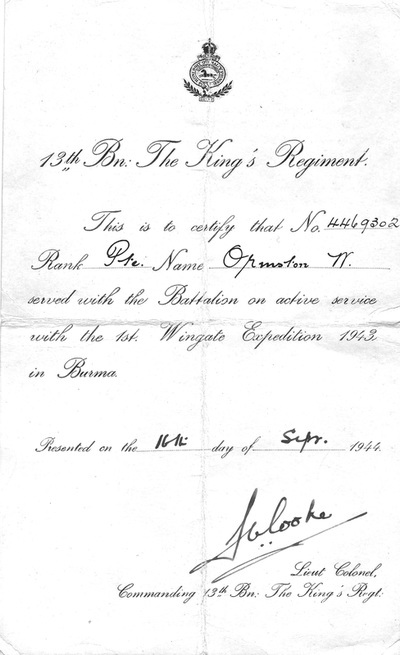 Seeing that Bill, and presumably Syd, Ren and Robbo were all with the Yorks and Lancs prior to joining the 13th King's at Saugor, has perhaps given me the answer to this mystery. Another draft of 208 men, mostly from the Royal Welch Fusiliers, the Lancashire Fusiliers and the Loyals has arrived and the Battalion strength is now over 1000. By the time the unfit men have been posted away, we shall be very nearly up to our War Establishment number, plus these first line reinforcements. (Captain David Hastings, Adjutant). Shown below are some of the new photographs mentioned in the above narrative. I would like to take this opportunity to thank Susan for sending me these invaluable additions to the story of the Bricklayers from No. 4 Column. Please click on any image to bring it forward on the page. Copyright © Steve Fogden and Syd Campbell, November 2014.